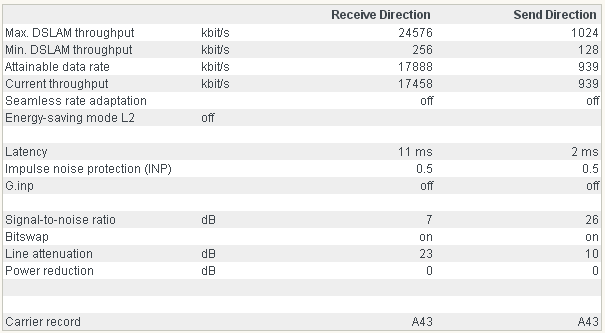 Just seeking recommendations of ISP's that I can churn to (away from eXeTeL). Don't get me wrong. I've been with eXeTeL for almost 11 years but it appears that my hand is being forced, as I've received their Notice Of Termination... apparently due to the fact that they are going to cease supplying services to my address. Unfortunately the Broadband Choice search facility on the Whirlpool.net.au forum has also been terminated :( Have tried a couple of other broadband search facilities but they all appear to only be affiliated with the major providers... not that that's a bad thing but I'm sure there are others out there that may offer great services which I don't want to overlook. - Nothing over $70 p/m. - No phone bundle... broadband only. - Free email addys and webspace would be a bonus. Looking forward to any suggestions that may help me decide. Thanx. Unfortunately the Broadband Choice search facility on the Whirlpool.net.au forum has also been terminated Have tried a couple of other broadband search facilities but they all appear to only be affiliated with the major providers... not that that's a bad thing but I'm sure there are others out there that may offer great services which I don't want to overlook. Thanks for the reply. Although I expect that the Sales Department will not be able to assist me much. Unless the Notice Of Termination Of Service I received recently which advised that "Exetel has made a commercial decision to cease supplying services to your address..." was wrong? If Exetel proceed to terminate my service, I haven't got much time left to churn away before the end of the month, so I was just reaching out to other members to provide me their suggestions for a good ISP that is supplying services to my address - which by the way, sits on the SARATOGA (SRTA) exchange... forgot to mention that earlier. I have passed the above information to them. Kindly wait until they get back to you. I've been with Exetel for nearly as long as you (Mar 06 I think) and I recently churned due to an almost 50% increase in fee from Exetel. I went with DODO unlimited for $29 (+ $39 phone line rental). My need was around 300GB per month. I don't game so didn't care too much about the fastest response times (though the teenage resident may occasionally bleet ). I was just after a responsive, stable connection with reasonable downloads. I stream AFLLive and FoxtelGO and will have multiple streams simultaneously (PCs, laptop, tablet, phones) whilst a background download is operating. I was initially concerned with DODO's reputation so chose to pay the $30 connection fee to allow a month to month plan. If I was unhappy I would just churn again without penalty. I've been happy so far (it's only been a month now). My speeds have been fine - both download and general browsing. 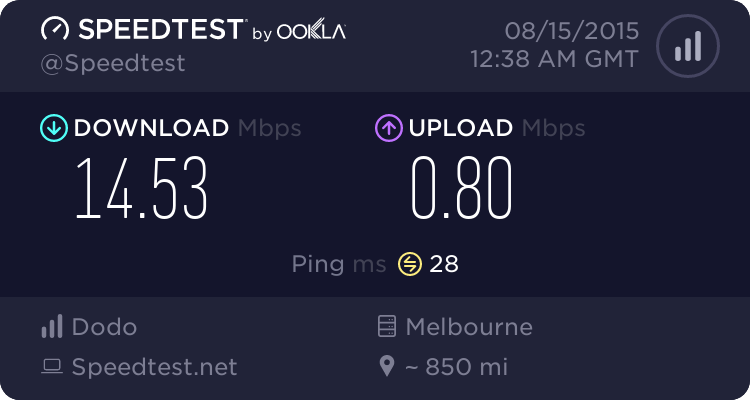 I'd say slightly better than exetel, less buffering / stuttering of AFLLive and FoxtelGO - I only got around 10Mbps with exetel. Now 14Mbps with dodo - stats below. Connection process was quick and simple. I applied online on Friday at it was set up on the Monday. No noticeable downtime (I was at work - reconfigured router when I got home. Reboot. Connected). Application status updates and login details via SMS. I would have chosen TPG, as they were cheaper by a few bucks, except I am off net (Regional exchange - Gippsland) so could only get ADSL. Others at work have http://ausbbs.com.au/ADSL-plans-and-pricing and are satisfied. Haven't used it myself though. Great stuff, DBR. Really appreciate it. You've managed to nail two of my concerns. One being the reputation of Dodo. And the other being AusBBS. I have just chosen to churn with AusBBS and paid the additional setup cost to go Month by Month, in case I needed to jump soon after. So I'm glad to hear that your work colleagues are satisfied with them.